USA’s Adam Rippon performs his short program at 2014 Finlandia Trophy. 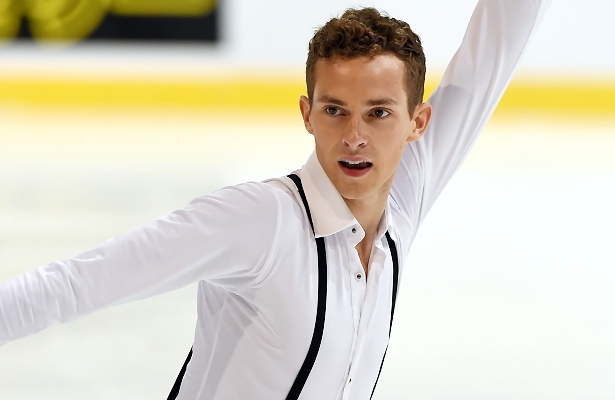 USA’s Adam Rippon is gearing up for his seventh year on the Grand Prix circuit, and will compete first at Skate Canada starting tomorrow, followed by Trophee Bompard later next month. Looking ahead, the 2007–08 Junior Grand Prix Final champion is keeping his fingers crossed for a spot at the Final in Spain, as well as the Four Continents and World Championships later this year. Earlier this month, the 2012 U.S. silver medalist missed the gold by a less than half a point at 2014 Finlandia Trophy, placing second (220.75) behind Russia’s Sergei Voronov (221.11). The skater from Clarks Summit, Penn., underrotated the quad toe and stepped out of the triple Axel in his short program to “Tuxedo Junction”, placing third with 68.53 points. Nevertheless, Rippon rebounded to win the long (152.22), landing seven clean triple jumps—including two triple Axels. While the two-time World Junior champion didn’t do a quad, it was enough to climb to second overall. The “veteran” skater is still young and still loves being an amateur athlete. The 2010 Four Continents champion admitted to being devastated that he didn’t make the US Olympic team last year, and contemplated retirement. Rippon’s mother and group of friends helped get through it, along with the outpour of support from social media, emails, and talks with others. In addition to the support he received, Rippon also regained focus by doing exhibition programs and working with other skaters on their choreography—namely Mirai Nagasu and Ashley Wagner. In terms of his own choreography, Rippon likes to be pushed outside of his comfort zone. Over the summer, the skater worked with his coach and choreographers on new transitions into all of his elements, and feels he has grown a great deal since last season. Dickson, who choreographed his long program last year, did so again with Rippon’s program to Liszt’s “Piano Concerto No. 1”. Rippon’s goals for Skate Canada are to skate with “reckless abandon”.